Fourintriguing places on Mars have risen to the final round as NASA selects alanding site for its next Mars mission, the Mars Science Laboratory. MarsScience Laboratory (MSL)project leaders at NASA's Jet Propulsion Laboratory, Pasadena, Calif., chose the four this month, after seeking input from international Mars experts andfrom engineers working on the landing system and rover capabilities to whittledown the initial list of more than 30 sites. The sites,alphabetically, are: Eberswalde,where an ancient river deposited a delta in a possible lake; Gale, with amountain of stacked layers including clays and sulfates; Holden, a cratercontaining alluvial fans, flood deposits, possible lake beds and clay-richdeposits; and Mawrth,which shows exposed layers containing at least two types of clay. Gale isnear the equator, Eberswalde and Holden are farther south, and Mawrth is in thenorth. 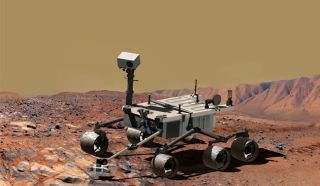 "Allfour of these sites would be great places to use our roving laboratory to studythe processes and history of early Martian environments and whether any ofthese environments were capable of supporting microbial life and itspreservation as biosignatures," said MSL project scientist John Grotzingerof Caltech. Themission's capabilities for landing more precisely than ever before and forgenerating electricity without reliance on sunshine have made landing siteseligible that would not have been acceptable for past Mars missions. During thepast two years, multipleobservations of dozens of candidate sites by NASA's Mars ReconnaissanceOrbiter have augmented data from earlier orbiters for evaluating sites'scientific attractions and engineering risks. JPL isassembling and testing the Mars Science Laboratory spacecraft for launch infall 2009. The mission plan calls for the rover to spend a full Mars year (23months) examining the environment with a diverse payload of tools. Afterevaluating additional Mars orbiter observations of the four sites, NASA willhold a fourth science workshop about the candidates in the spring and plans tochoose a final site next summer. One site,Gale, had beena favorite of scientists considering 2004 landing sites for NASA's Spiritand Opportunity rovers, but was ruled out as too hazardous for the capabilitiesof those spacecraft. "Landingon Mars always is a risky balance between science and engineering. The safest sitesare flat, but the spectacular geology is generally where there are ups anddowns, such as hills and canyons. That's why we have engineered this spacecraftto make more sites qualify as safe," said JPL's Michael Watkins, missionmanager for MSL.